Bathroom Remodel, Bathroom Remodeling, Bay Area, Home Remodeling, Interior Designer, Kitchen Remodel, Kitchen Remodeling, Oakland CA, Remodeling Contractors, San Francisco, SOD Builders Inc. When you’re choosing the type of backsplash for your home, it’s helpful to know what is on the market and how it fits into your lifestyle. Some of the backsplash choices will require maintenance to keep them clean and fresh looking through their life, while others won’t suffer aging because of the materials used. Glass Tile: This look can add a very clean design element in your kitchen or bathroom remodeling. The glass is easy to clean off and it doesn’t wear or stain. It does carry a higher price tag than some other materials. Magnetic Material: Completing your backsplash in stainless steel adds a magnetic surface for you to use. With the magnetic surface, you can use the walls to stay organized. You can even use it to store your spices and keep them handy for cooking. Natural Stone: Marble can be used for the countertop and the backsplash alike. Porous stones need to be sealed regularly to keep them from staining. Ceramic Tiles: Ceramic is affordable and durable material. It is easy to clean too. It comes in a range of different patterns and styles. Porcelain Tiles: Porcelain is a very dense material that is resistant to moisture. It is made from the same material as ceramic, but it is more durable. 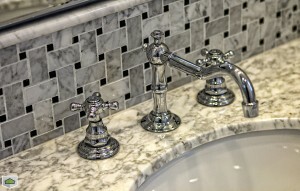 Mixed Materials: Styles and patterns have become more intricate and interesting for luxury home remodeling projects. There are many options for you to use in your bathroom or kitchen remodel that mix the materials, adding a splash of glass as an accent among natural stone and other materials. If you can think of it, you can add it to your walls to complete your backsplash. Whatever the materials are you choose, have the backsplash for your kitchen and bathroom to compliment the rest of the elements in the room. Add good grout, and seal the grout to help it hold it’s original look over time. Talk to an interior designer to help choosing the right materials and colors for your lifestyle and home. Take the time to make your luxury home remodeling something you will love for years to come.